Paper Crafts by Candace: Jaded Blossom Customer Blog Hop! Happy Friday! And welcome to the Jaded Blossom Customer Blog Hop! If you are here from Jaded Blossom then you are in the right place! If not click on the logo below to go back to the Jaded Blossom blog to find the line up and check out all the details! There are a ton of amazing crafters in this line up, please make sure to check them all out. There are some PRIZES up for grabs as well! All you need to do is comment on all the blog for your chance to win! Now on to my project!! Here is what I made..
A girl at work is having a baby boy soon and her theme is Jungle so I created this card for her. The lion is from SVG Cutting Files "Leo". I used Jaded Blossom's Card Mat Dies, Circle Stitched Dies, Mini Tag Dies 2, Goody Bag Die and Sweet Baby. Thanks so much for checking out my project! Make sure to go back to the Jaded Blossom Blog to see who is next in the line up! Gorgeous Baby card, just love Leo. It's really adorable! I'm anxious for the card mat dies to be in stock again. such a cute little baby lion card !!! This is just ADORABLE! I love the soft colors and that paper is so cool! Oh my goodness what a sweet and precious card. 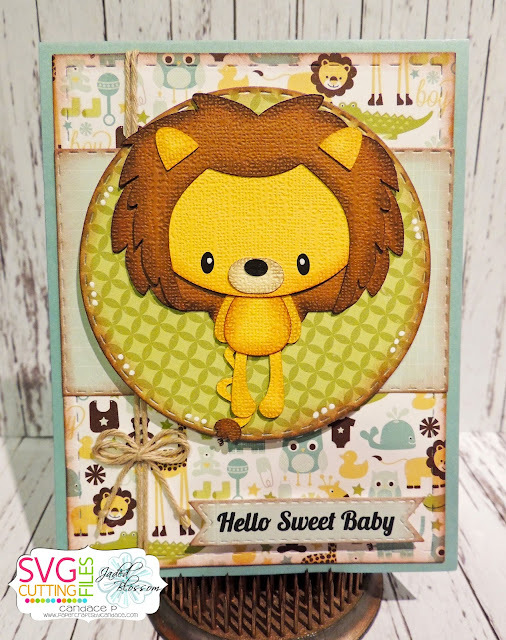 Perfect baby card...your co-worker sure will enjoy this cute lion! Super cute card! Love that lion!! Love this and have the paper. Whoo hoo! So sweet and perfect for the jungle theme. Love this! No lion, that is so cute! What an adorable baby card! Such a cute little lion! Such a sweet card ... awesome job!! No Lion, this card is super CUTE!!!! Leo is adorable. I love the cute papers you used behind him! Aaaw, sweet card! What a cute lion! Fun design! This is the cutest Baby Card - just love how it turned out!!! I'm sure your friend will frame this little guy. Too cute!! Very cute card! Love the cute lion! Love that paper!!! And your card! You did a wonderful job following your friends theme and still make such a cute card. Love the card! The lion is so cute. Cute new baby card. That lion is adorable! Fabulous card! Love the lion so cute! Too stinkin' cute! I'm in the middle of planning a jungle themed baby shower. This is perfect!!! Such a sweet baby card! Love your paper choices! Very cute card!! Love the lion!! Very cute lion and the background paper is perfect. I saw this on FB and it is Adorable!! Jaded Blossom July Die Release Hop!